Issue #46 • September 18, 2016•Buy Now! There were three hundred of us crowded into the cafeteria, in uniform, waiting for our first-day-of-the-year homeroom assignments. Three hundred powder blue shirts tucked into three hundred pairs of navy pants. Talk about the ugliest damn outfits you’d ever want to see, let alone wear. I figure Helen Keller or somebody must have been a last minute replacement as the costume designer for our little scholastic menagerie. As far as I know, Mr. Dunbar isn’t color blind, so it’s the only way I can justify it. Mr. Dunbar. Don’t even get me started on that guy. You don’t get to be a junior without seeing your fair share of administrators, so I’m speaking as an expert here. There are two kinds of principals: those who lollygag around the hallways, smiling so that they mask their confusion and ineptitude, and those who march around the hallways like pissed-off Army generals with raging cases of hemorrhoids, scowling so that they mask their confusion and ineptitude. See where I’m going with this? Dunbar is the second kind. Ed Doerr enjoys writing for both adult and young adult audiences. While “Comfort Food” is his first notable YA work published, he has recently finished his comedic YA novel and is hard at work looking for an agent. Ed’s prose, poetry, and nonfiction have been published or are forthcoming in Water/Stone Review, The Tishman Review, Tipton Poetry Journal, Firewords Quarterly, the New York Times bestselling collection It All Changed In An Instant, and elsewhere. When Ed isn’t writing, he teaches middle school English in New Jersey, where he lives with his wife and pursues a master’s degree in Creative Writing from Fairleigh Dickinson University. “Comfort Food” is one of my favorite kinds of short stories. Something has happened in the main character’s past that has stuck with him and haunts him. Something similar is about to happen in his present—something that will also stick with him and might very well haunt him—but exactly how these two things play off each other is not readily apparent. We, as readers, are allowed to figure things out just as the main character does. In this way, reading “Comfort Food” is a collaborative experience. 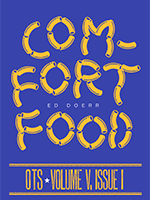 One Teen Story is proud to be ushering into the world this new work by Ed Doerr. It’s very funny, a little sad, maybe even a tiny bit shocking. It also has a wonderful narrator named Travis whom you won’t soon forget. I hope you enjoy it as much as I did. ED: I never had an Uncle Frank, but I did have an Aunt Donna. When she died, my world turned completely upside-down. A decade later, I wanted to write a story about a young man experiencing and then continuing to deal with an equally profound loss. PR: This is kind of a spoiler alert (reader be warned!). Was there ever a version of this story in your mind where Mr. Reed survives? ED: It never occurred to me to let Mr. Reed live. This is really the story of Travis finally dealing with the death of a close relative, so he has to relive that loss in order to confront it and the emotional wounds it left behind. Mr. Reed’s declining health and unceremonious death provide that possibility. Travis has been living with the pain for so long that something really traumatic has to occur to shake him up. PR: Can you talk a little more about that? How does Travis handle what happens to Mr. Reed differently from the way he handled what happened with Uncle Frank? And what do you think he carries away from these two experiences? ED: In some ways, Mr. Reed’s death gives Travis a do-over. When Mr. Reed collapses in the classroom, there are several parallels between that event and the death Travis relays in flashback. The difference this time is that Travis is more responsive; where he failed previously, he succeeds this time. But Mr. Reed still dies, regardless of Travis’s intervention. This makes Travis realize that part of the pain he’s been carrying around stems from guilt: being unable to save his family member. But now he realizes that his response would be irrelevant. There’s nothing he could have done. This, of course, brings anger, but as Travis chips away at the emotional wall he’s put up, the closer he gets to processing his loss. PR: For being a story that contains more than one death, there’s a lot of humor here. I laughed out loud more than once. Did that happen accidentally, or were you consciously trying to weave humor into the voice? ED: It was a conscious choice from the outset. One of the things I’ve always appreciated most—whether in literature, film, or television—is when a story doesn’t confine itself to one tone the entire way through. Sometimes, the drama feels more authentic when there’s some levity mixed in, so pushing myself to find those moments of humor became really important. Our lives are defined by a wide range of emotions and experiences, so I didn’t want to limit “Comfort Food” to a strictly glum tone. That didn’t feel real to me. Plus, there’s the fact that Travis feels like too savvy a character not to have a pretty astute sense of humor. ED: I’ve recently finished my comedic young adult novel called Concentric Circles, so the goal now is to begin querying agents. In addition to my novel, I’m in the midst of several short stories, poems, and essays. ED: “Read like a writer.” Pick some authors you love, those you consider the kind of writer you aspire to be, and study what makes them so great. For me, that means studying the likes of Flannery O’Connor, David Foster Wallace, Anton Chekhov, Sherman Alexie, Lois Lowry, Stanley Kunitz, Sandra Cisneros, Stephen King, John Green, and Kurt Vonnegut. Look at everything from sentence structure to imagery to characterization. I know this seems like such a simple thing, but when I started training myself to read like a writer, to recognize what makes writing great, it really changed the game for me. I’m not within one billion miles of any of those names I just listed, but with everything I write, I try to get just one step closer.